The magnificent Quirimbas Archipelago in Cabo Delgado Province, Northern Mozambique, is a captivating chain of 32 islands waiting to be discovered by you. These idyllic islands stretch from the quaint city of Pemba in the south to the town of Palma in the north. Some of the charming islands in the south include a vast expanse of enchanted forest in the Quirimbas National Park. The park was established in 2002 as an answer to the local community’s need to nurture and sustain their precious natural environment. Feeding and nesting grounds for the park’s delightful population of sea turtles, dugong, dolphins, sharks and whales are found here. 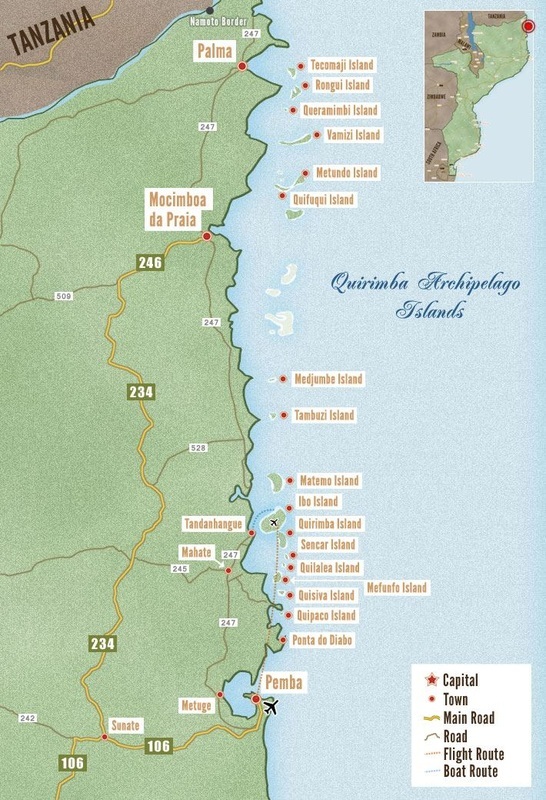 The impressive 1,500km2 marine area of Quirimbas National Park includes 11 coral islands stretching for 100km. These islands feature phenomenal vertical drop-offs, some up to 400 meters. These walls are abundant with coral covered caves and tropical fish ranging from gobies to mammoth Napoleon Wrasse and game fish including Kingfish and Spanish Mackerel. The Quirimbas Archipelago stretches for 100 kilometers along the Mozambique coast. These tropical islands contain some of the richest coral reefs in the world and provide habitat for an abundant array of marine life. The Quirimbas Archipelago consists of 32 tropical coral islands stretching from Pemba (the capital of Cabo Delgado Province) to the Rovuma River, which forms the natural frontier between Tanzania and Mozambique. The area has never been developed and remains an unexplored tourist paradise. Pemba is the access point for the Quirimbas Archipelago. This Archipelago is another pristine destination, although more remote and less frequented than Bazaruto Archipelago. Snorkelling, fishing and diving in these waters doesn't get better than this!